Enter your about me text. 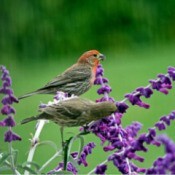 House Finches on SageOur Mexican sage plants are beautiful. The purple of the blossoms is incomparable. 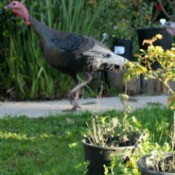 Often different birds visit the large sage in the front garden to find a seed or two to eat. Wildlife: Wild Turkey (Santa Barbara, CA)I had gone out of the house to the front to pick up my morning newspapers when lo and behold, straight down the sidewalk came 2 beautiful wild turkeys strutting along! I was quite near them. 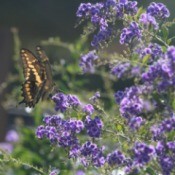 Diving Swallowtail Butterfly! 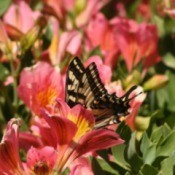 (Santa Barbara,...Our Alstromeria was in beautiful full bloom that day when I spotted this Swallowtail Butterfly with his "nose" in the Alstromeria blossom. I ran to get my camera, and took this photo. Swallowtail Butterfly on Picotee Sky Flowers TreeEarly morning and the swallowtail had landed on the picotee sky flowers tree blossoms. 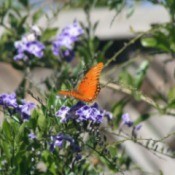 It is as though the butterfly had posed for the photo, wings up stretched, body showing in the early light. The light coursing through its wings gave a wonderful view of the beauty of its wing markings. Summer Christmas CactusIn our mild and rather warmish climate near the coastal plain of S. California, our Christmas cactus often bloom in the summer. Here is one from August, 2016. Others on my Schlumbergera (name of Christmas cactus family) plant area are budding out now in September, 2016. The colors are amazing and neon! Fritillary Butterfly in the Sky FlowersHere is a Fritillary butterfly sitting on picotee sky flowers tree blossoms in our drought tolerant garden. Its lovely silver wing spots on lower side of wing are not visible in this view. Cistanthe Grandiflora JazztimeThe Cistanthe grandiflora Jazztime is a wonderful plant. 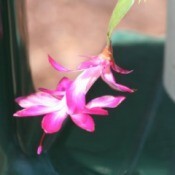 It casts its neon glow throughout the garden in multiple blooms. 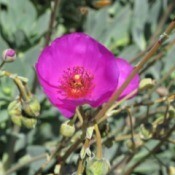 It is indeed an "eye catcher" and is drought tolerant. A small plant soon erupts into a very large, roving succulent like plant and produces many lovely blooms. 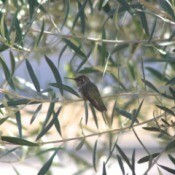 Hummingbird Takes a RestOur olive tree has become a "station" for Anna's hummingbirds in our garden to take a rest. It is a shady environment and the hummingbirds daily use it for a short break in their action. They "buzz" around the garden with great vigor and during their feeding times, they visit most blooming plants for a meal.